Electrical Conductivity (EC) affects a plant's ability to absorb water through osmosis. Plants will thrive when EC is kept consistent, but they suffer when it oscillates or gets too high. Understanding the basic science behind EC and Osmosis will help you to manage your grow like a pro! This article covers everything you need to know and understand about osmosis, EC and PPM. Plants draw water across the membranes of their roots through the process of osmosis. The force that actually drives the movement of water comes as a result of osmotic pressure that is only partially controlled by the plant. Osmosis always pulls water from a less concentrated solution to a more concentrated solution. Under fertigation, the nutrient solution is on one side of the root membrane and water inside the root is on the other. Plants produce sugars in their roots which raises the concentration of the solution within the root and causes water to enter from the nutrient solution. The fertilizers that we use are different forms of salt. If you put too much salt in the water then the plant will not be able to pull water in from the nutrient solution. The plant will struggle to get water as the nutrient solution gets saltier. If it is very salty, osmosis can reverse and water can actually be pulled out of your plant. EC is important because it measures the salinity of the water. Managing EC effectively encourages healthy vigorous plant growth. As discussed further below, failure to control EC will slow plants and can cause serious problems with dehydration. EC stands for “Electrical Conductivity”. It is a measure of the salinity of the water. Water filtered through Reverse Osmosis (RO) or distilled water has an EC of 0. EC is measured in millisiemens per centimeter (values like 0.00-2.00) or microsiemens per centimeter (values like 0-2000). One millisiemen = 1000 microsiemens. My meter reads in microsiemens, which offer more precision, so I use those values throughout. 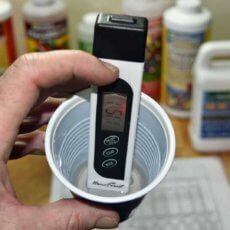 Many growers are more familiar with PPM than with EC. However, PPM is actually just a calculation made from measuring EC. Both EC and PPM measure the exact same thing, they just use different numbers to express the information. Unfortunately, there are several different formulas used for converting EC measurements into PPM numbers. Most meters use the PPM500 conversion where an EC of 1000 reads as a PPM of 500. This is the conversion that my meter uses. It is also the conversion used by US nutrient companies, like General Hydroponics. If your nutrient supplier provides only PPM numbers and not EC, you should assume the conversion is PPM500. Unfortunately, the PPM500 conversion is not the only conversion factor used. Many meters use the PPM700 conversion instead, where the same EC of 1000 would read as a PPM of 700. EC is always measured the same in either millisiemens or microsiemens per centimeter, as described above. Every EC reading is comparable in a way that different PPM readings are not. For this reason, it is better and easier to simply use EC rather than PPM. Most meters will give both EC and PPM. If yours only does PPM that is not a deal breaker, but you will need to know which conversion factor it uses. What Happens to the Water and the Salt? 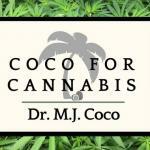 When you add nutrient solution to the coco, you are adding both water and salts. To understand how EC changes between fertigation events, it is important to consider what happens to each. 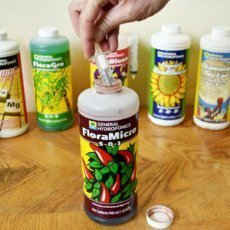 Remember, plants do not absorb nutrient solution “through a straw” or “like a sponge”. Water and salts (fertilizers) are taken up by the plant separately. Under normal conditions, water is removed about four times faster than salts are absorbed. As a result, the EC of the nutrient solution in the media will rise between fertigation events. The Plant: Plants absorb water through osmosis leaving increased concentrations of salt in the nutrient solution in the coco. Plants also absorb nutrients and thus lower the quantity of salts in the solution. However, they remove the water much faster than they remove the salts. The vast majority of this water moves through the plant and is lost through transpiration. The water that goes to the plant raises the EC of the nutrient solution in the coco. 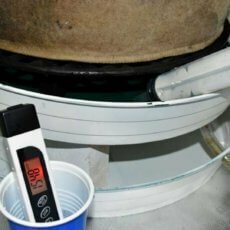 Evaporation: As water sits in the pot suspended in the coco between fertigation events it is constantly evaporating. The water that is lost to evaporation causes EC in the remaining nutrient solution to increase. Evaporation raises the EC of the nutrient solution in the coco. Because of transpiration and evaporation, the EC in the coco is lowest immediately following a fertigation and “Peak EC” occurs just prior to the next fertigation event. The fertigation events themselves are responsible for lowering the EC in the coco. It may seem counter-intuitive to lower the level of salts by adding nutrient solution, but the process occurs through run-off. The Run-off: As fresh nutrient solution is added to the coco it pushes out old nutrient solution which had been suspended in the coco. The run-off is not the same water that you are adding in the top. Run-off is higher EC than inflow because it has been sitting in the coco and subjected to the forces of transpiration and evaporation. Run-off carries salts out of the coco. Following each fertigation, the nutrient solution in the coco is closer to the inflow EC. Run-off lowers EC by flushing excess salts. Water is removed through transpiration and evaporation, whereas salt is only removed via run-off. 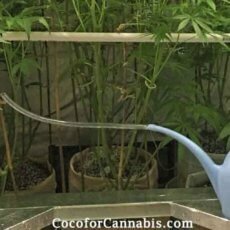 As a result, frequent fertigation with adequate run-off is essential to manage EC and get the best results from your coco grow! Plants receive water via osmosis across the membranes in their roots. Water moves through root membranes in the direction of higher concentration. In order for the roots to get water, the concentration of sugars within the roots must be higher than the concentration of salts in the nutrient solution. Plants are adapted to adjust to the osmotic gradient and produce sugars in their roots which raise the concentration and encourage water to enter the roots. However, high EC nutrient solution can easily overwhelm the plant’s ability to raise the concentration of sugars in her roots. High EC Causes “Nute Burn”: If the EC of the nutrient solution is higher than the plant can handle she will start to struggle to get water. In fact, if the EC gets too high, osmosis can flow in the opposite direction and water is literally pulled out of your plant. This struggle for water and “reverse osmosis” is what causes all of the symptoms that are known as “nute burn” or “fertilizer burn”: wilting, burned tips, crispy dry leaves, leaf curling, slow growth, and eventual plant death. If you are experiencing even minor signs of nute burn, that indicates that your plant is struggling to pull water against a too high EC. Rather than helping growth by “giving lots of food” you are hindering it by starving the plant of water. “Burn” symptoms should be met with remedial actions. See our tutorial, “How to Manage Run-off EC”. When the EC of the nutrient solution is too low, plants drink too much water and produce fewer sugars. This is because the concentration of sugars within their roots is in response to the EC of the nutrient solution. When the EC of the nutrient solution is low, plants may initially take in too much water because the concentration of sugars in their roots is higher than the concentration of salts in the nutrient solution. Drinking this extra water does not mean they are taking in additional nutrients. Plants take in water through osmosis and nutrients through separate diffusion and transport processes. Low EC exposes the risk of under-fertilizing because there is necessarily less fertilizer in the water. However, under-fertilizing is only one of the concerns. Plants produce sugars and other good things when EC is correct. They must do this to pull water into the plant through osmosis. If EC is low, plants produce less of the “good stuff”. When EC is constantly fluctuating, the plants are constantly working to adjust. 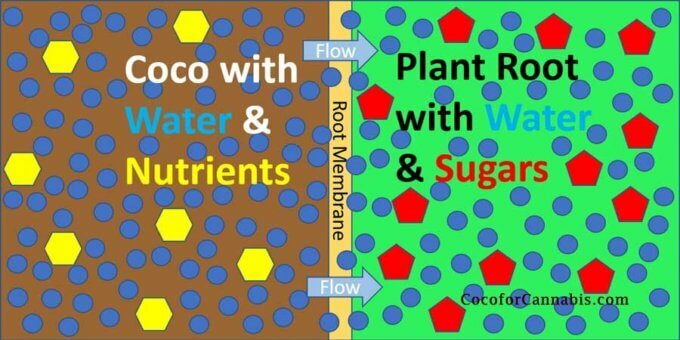 To receive water through osmosis, plants need to adjust the concentration of sugars within their roots. When the EC of the nutrient solution is lower than they are prepared for, they take in too much water and have to lower the concentration of sugars in their roots. Conversely, when the EC of the nutrient solution is higher than they are prepared for, they cannot take in sufficient water and have to direct their energy into producing sugars to raise the concentration in their roots. When the EC goes up suddenly, plants can suffer burn even at relatively low ECs because the roots are prepared for even lower. The common practice of interval flushing in coco with one watering of nutrient solution and one watering of "plain", "pHed", or "CalMag" water should not be practiced because it results in unstable root zone EC and forces plants to constantly adjust. Keeping plants healthy and happy requires delivering a nutrient solution with a consistent EC at each fertigation event. There are times when you need to change the EC of the inflow. This occurs with changes in the plant’s life cycle following the feed charts. During the transition from seedling stage to early veg nutrients, increase the inflow EC by no more than 100 points per day. To learn how to manage EC in your grow, be sure to read our tutorials, “How to Set EC Targets”, “How to Mix Nutrient Solutions” and “How to Manage Run-Off EC”.